The integrated design approach of the Palmilla Community provided a unique “lifestyle living” environment, increasing home values and sales pace that outsold conventional tracts. 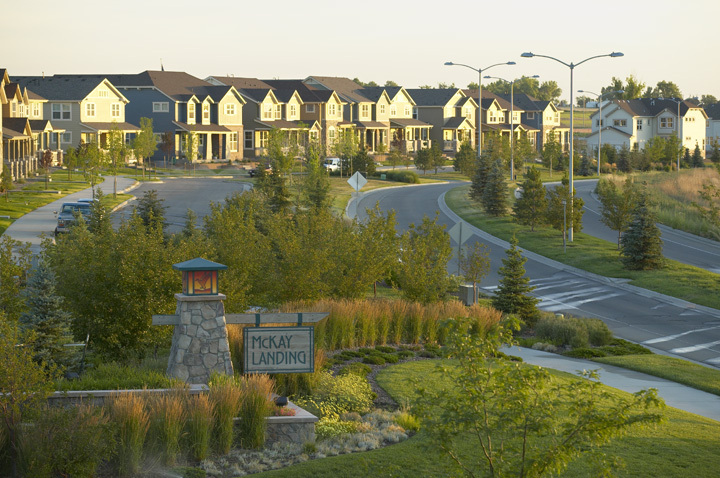 The site planning strategy was designed to integrate housing with ponds and water features for all homes, provided a development strategy that maximized lot premiums. The site plan created housing clusters with landscape for easy phasing. Creative site and building walls divided paired homes allowing for privacy and the integration of indoor- outdoor living. Strategic investment in community amenities and public infrastructure at Anthem Colorado, including recreation centers, parks, open space and trails, helped increase home values and sales pace over conventional communities, even during the recent economic slowdown and great recession. Creation of a comprehensive vision and design guidelines provided a commitment to quality that helped streamline the approval process and instill a sense of security for the City, as well as builders and home buyers. The wide mix of residential uses and smaller, defined neighborhoods provided a unique niche and increased absorption in the marketplace. Development of a “marketing journey” and Welcome Center created an important first impression and established a “sense of place” for visitors and home buyers. The Design Vision for the MidTown Neighborhood represented the integration of a diverse mix of housing and commercial development on a challenged brownfield site on the urban fringe of Denver. The master plan included a mix of residential housing and a neighborhood commercial center that created an interconnected network of streets, with connections to the adjacent neighborhood. Design Guidelines were created to address the untapped market that desired a fresh Architectural Style. New housing product and lot design leveraged the side yards to create indoor-outdoor courtyards for more expansive living on smaller lots. A Community Center and Main Street Retail integrated functional Urban Gardens and crisp modern styling that became the entry experience and community identity for the project. Let us demonstrate how our integrated approach can benefit your project. Have an idea? Let's talk.